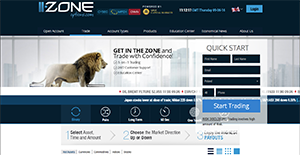 Zone Options’ trading platform is also built with mobile users in mind. The platform is developed with the ability to support trading on mobile devices like Blackberry, iPhone, and iPad. This feature enables traders to perform trading functions even if they are away from their office and on the go. Zone Options offers a comprehensive education center that has helpful tips, webinars, eBooks, videos, and more. You can use the training materials to educate yourself about assets, market trends, and general trading information. This broker keeps traders up to date on important world news through its Daily Analysis and Live Trading Data features. Zone Options helps you trade like a pro by offering the assistance of its knowledgeable support agents whom you can contact by phone, live chat, email, or SMS. You can contact your account manager to learn more about this broker’s personal support service. No deposit is required to register. Zone Options provides 24/7 customer support. It is important to note that virtually no service in the Binary Options Brokers category is a perfect solution able to meet all the goals of various investors. It may be a good idea to read a few Zone Options reviews first as specific solutions may actually perform well exclusively in a specific geography or situation or be prepared with a very specific customer in mind. Others may function with a goal of being simple and intuitive and consequently lack advanced elements desired by more experienced users. There are also services that cater to a large group of users and provide a complex feature base, but that in most cases comes at a higher cost of such a software. Make sure you're aware of your requirements so that you get a service that has all the functionalities you look for. We realize that when you make a decision to buy Binary Options Brokers it’s important not only to see how experts evaluate it in their reviews, but also to find out if the real people and companies that buy it are actually satisfied with the product. That’s why we’ve created our behavior-based Customer Satisfaction Algorithm™ that gathers customer reviews, comments and Zone Options reviews across a wide range of social media sites. The data is then presented in an easy to digest form showing how many people had positive and negative experience with Zone Options. With that information at hand you should be equipped to make an informed buying decision that you won’t regret. What Bonus Does Zone Options Offer? - Claim up to 40% or 4000 USD/EUR/GBP when you make your first deposit. - You can also get a bonus of 20% for deposit amounts between 250 and 499, 30% for amounts between 500 and 999, and 40% for deposit amounts that exceed 1000. As ZoneOptions is based in Cyprus, the broker has to adhere to strict policies and regulations implemented by recognized regulatory bodies. Being a new entity in the binary trading scene, there is little operational history ZoneOptions can offer its traders. To win their confidence, ZoneOptions implements a ‘First Time Risk Free Trade’ option policy, which stakes the broker’s money if anything goes wrong for first time traders.